Two Leaves and a Bud is a company that makes many different kinds of tea. I got to sample a box of different teas and have really liked them so far. They make 18 different kinds of tea and this box has a sample of each. I tried the mountain high chai tea and loved that with a little milk in it. I also tried the organic white peony which was tasty but needed a little bit of sweetener. I really like the cute packaging that the tea comes in. It is neat that they are individually wrapped because it makes it easy to take them in my lunch or keep them in my desk at work. Another perk of this tea is that the package tells you how much caffeine is in each tea. This helps you know how much you are getting and which one to drink at the different times of the day. I can't wait to try the rest of these delicious teas! The giveaway will be for a box of the Complete Sachet Sampler (18 different teas) to two different winners from Two Leaves and a Bud. The giveaway is open until Midnight on Tuesday April 12th. Winner will be chosen on Wednesday April 13th using Random.org. The winner will have 48 hours to respond or a new winner will be chosen. 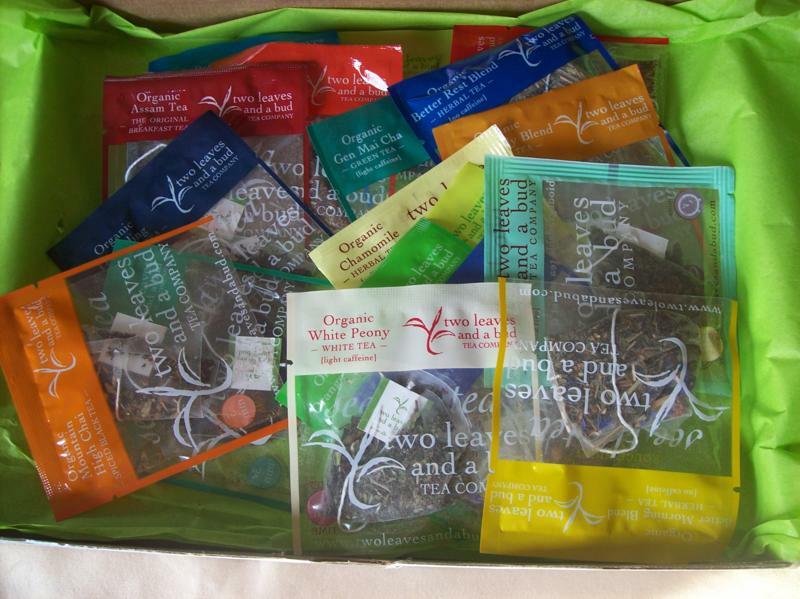 Visit the Two Leaves and a Bud website and let me know which kind of tea that you want to try the most! -Like Two Leaves and a Bud on Facebook (2 entries). The tropical goji green sounds great! I would like to try the Organic Japanese Sencha! I'd love to try the darjeeling tea! Thanks! i would like the pomi berry. I'd like to try the Mountain High Chai. I'd love to try the Pomi Berry! Sounds yummy! I entered the heel repair giveaway! I entered the honee giveaway! I'd want to try mountain high chai! I most want to try the Mountain High Chai tea! I want to try their Jasmine Petal Green tea! I subscribe via GFC under Kayla @ TheEclecticElement! I entered your Bee Free Honee Giveaway! I would like to try the better morning blend. May Canadians enter? I'd love to try the Organic Assam Breakfast. I'd love to try their Better Morning Blend! I would like to try the Better Rest Blend. Sounds so heavenly. I entered the Woodrow Wear giveaway. Orange Sencha would be my flavor of choice! I'd like to try the gen mai tea.